yoto is awaiting tourists with plenty of must-see spots including such historic buildings as traditional Buddhist temples and Shinto shrines, as well as a variety of must-try activities, including strolling around the city, shopping, and enjoying local specialty foods. 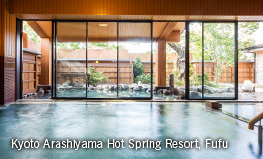 In addition, ONSEN(= hot springs) are attracting tourists’ attention as new must-visit places in the area around Arashiyama and in the area around Kyoto Station, which are both very popular tourist destinations. One of Kyoto’s prominent features is traditional sacred places, including shrines and temples, which provide tourists with the delight of seeing beautiful seasonal scenery. Japanese people have a custom of purifying themselves before entering sacred places, which are dedicated to deities. The custom is called “misogi” in Shinto and “kori” in Buddhism. 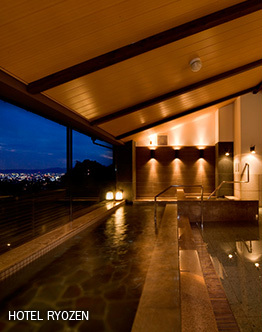 ONSEN are ideal places to refresh yourself physically and mentally before visiting sacred places, with the aim of having your prayers answered by the deities. How about trying a way of enjoying ONSEN, particular to Kyoto, spending a valuable time praying to extend gratitude for nature’s blessings and divine protection? Arashiyama, symbolized by the famous Togetsukyo Bridge, is one of the representative tourist destinations in Kyoto. This area, blessed with rich nature though in the vicinity of downtown Kyoto, has a long history as a flourishing villa resort for nobles to enjoy the changing seasons. Popular Yakatabune (houseboat) cruising, a kind of staple here, is an elegant leisure activity that has developed from boating initiated by Emperor Daido over a millennium ago. The name of the Togetsukyo Bridge (literally “the bridge crossed by the moon”) is also presumed to have originated from the ex-emperor Kameyama’s stating, “It seems as if the moon is crossing the entire bridge,” when he enjoyed boating here in the Kamakura period. 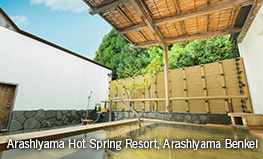 As seen above, the Arashiyama area is a place of history and tradition handed down to today. 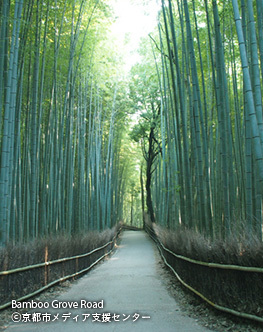 Moreover, Arashiyama with wonderful scenery enables visitors to experience the dynamism of the changing seasons. Here you can enjoy spring with pinkish cherry blossoms in full bloom, summer with lush greenery, autumn with the mountains covered with golden leaves, and winter scenery like Japanese ink paintings. This area also boasts Tenryuji Temple, a component of the World Heritage site, a passage in bamboo groves, historic shrines and temples, etc. 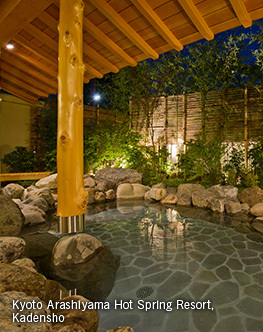 Natural ONSEN near such tourist destinations are among the best places to heal yourself while enjoying the essence of travel. 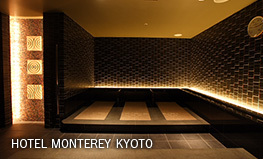 There, charming facilities offer warm treatment to tourists, and are cherished by many people, including Kyoto connoisseurs, as ideal places to take a rest, purifying themselves before visiting shrines and temples or simply healing their tiredness. The area around Kyoto Station has a high density of renowned tourist spots, including the Nishiki Market called the “kitchen of Kyoto,” traditional kyo-machiya (Kyoto-style traditional merchant houses), shrines and temples, and the Kyoto National Museum showcasing Kyoto culture. 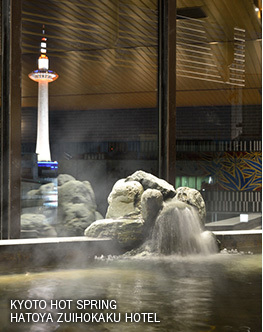 Hot spring inns in downtown Kyoto, convenient bases for tourists with good transportation access, are highly recommended to people who hope to leisurely enjoy bathing in hot springs after strolling around tourist spots. 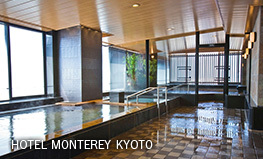 Some hotels have wide-view baths and large public baths on the higher floors, so you can enjoy a wonderful panoramic view of the city while healing yourself in ONSEN. 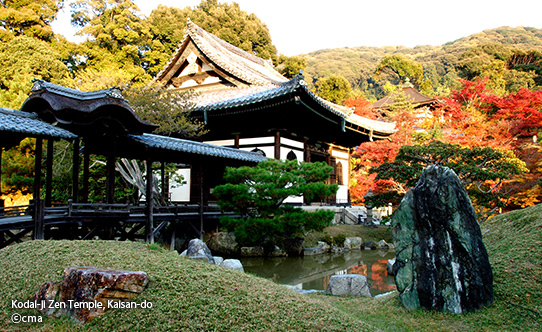 In Kyoto with so many tourist spots within a walkable distance, you may walk too much. Why not stroll around not only sacred places and “power spots” but also ONSEN in Kyoto, to refresh yourself physically and mentally and enjoy your travel around Kyoto to the fullest? 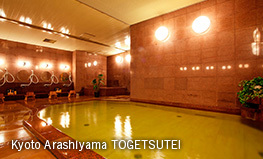 Copyright © Kyoto City Council for the Vitalization of ONSEN Tourism All rights reserved.